The copy of Hermann Goering’s radio message to Hitler in April 1945, warning he might take control of Germany, will be on view at the Natick museum beginning Tuesday. Adolf Hitler’s second-in-command radioed the message to the fuhrer just before 1 a.m on April 23, 1945, as the Nazi leader hid from the advancing Red Army in a Berlin bunker. Hermann Goering said if he did not hear from Hitler shortly, he planned to enact a secret 1941 decree and take control of the German government. Hitler reacted by denouncing Goering as a traitor and ordering his arrest. Seven days later, Hitler committed suicide. On Tuesday, this important artifact from the Third Reich’s final days goes on display at the Museum of World War II in Natick. It will be added to the collection that covers the end of the war, said museum founder Kenneth Rendell. Rendell purchased a transcription of the message on July 7 for nearly $55,000, beating out a “determined bidder” from Germany. Alexander Historical Auctions LLC, had estimated the document would sell for much less — $15,000 to $20,000. 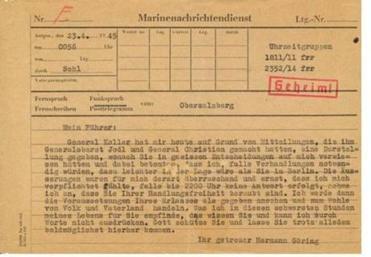 A transcription of a radio message that Hermann Goering sent to Hitler days before his suicide will go on display Tuesday at the Museum of World War II. 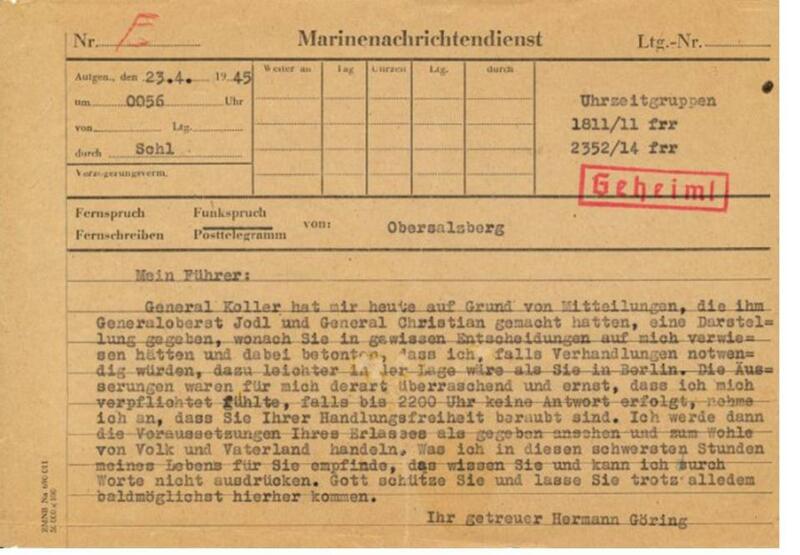 The document Rendell purchased belonged to Hitler’s private secretary, Martin Bormann. The auction house said an account by Hitler deputy Albert Speer indicates the copy is “very likely” the one that was read to the Nazi leader. Boston College history professor Devin Pendas said the contents of Goering’s message have been known since at least the 1960s, but that original documents like it are hard to find in the United States. The document joins other artifacts about the unraveling of the Third Reich on display at the Natick museum. Some notable items include a memorandum in which Speer wrote that the war was lost and Germany must try to protect its infrastructure, and an order from Hitler commanding the Nazis to do just the opposite, Rendell said. The museum also has a portion of the blue sofa where Hitler and his wife, Eva Braun, committed suicide by ingesting cyanide, he said. Hitler also shot himself with a service pistol. The document’s journey from Hitler’s Berlin bunker to its new home in Natick winds through South Carolina, and later into the hands of an independent scholar with ties to the University of Oxford, according to the auction house. After the fall of Berlin, Army Captain Benjamin Bradin entered Hitler’s bunker and found it had been ransacked by the Soviets, said his grandson, retired Army Special Forces Colonel Stuart Bradin. The elder Bradin scooped up documents, including Goering’s message, from atop a desk and brought them home to South Carolina. “A lot of people were looking for things of value and my grandfather picked up [stuff] that he thought was of historical value,” said Bradin, 53, who lives in Florida. The document, and other papers from the bunker, sat unexamined in a bank vault until about 1958, the auction house said. At the time, Benjamin Bradin’s son, James W. Bradin Sr., was a student at the Citadel and brought the papers to his history professor, Robert Rieke, for inspection. Rieke translated the papers from German and encouraged his student to write about the documents for his senior thesis. James W. Bradin Sr. later gave the message and a blank invitation from Hitler to Rieke, who turned it over to one of his students and confidants in 1978, the auction house said. Rieke’s student put the document in a safety deposit box and kept it there for 22 years while he was on sabbatical at Oxford. Panagopulos said the man, whom he would not name, contacted his auction house in early April and asked what it was worth. James Bradin’s sons said their father, a retired Army colonel who is now 80, acknowledged giving the message to his professor. Most of the proceeds from the sale go to Rieke’s confidant, who lives in North Carolina, Panagopulos said. Stuart Bradin said his father will be thrilled to have the document displayed in the museum. “People need to be able to see this stuff,” he said. Nicholas Best, who wrote about the end of World War II in “Five Days that Shocked the World,” said translations of Goering’s message to Hitler have become garbled over time.